ICHRI: Nasrin Sotoudeh, a prominent Iranian lawyer, has dedicated her life to fighting for human rights and defending prisoners of conscience in Iran. For her work, she was recently awarded the European Parliament’s prestigious Sakharov Prize for Freedom of Thought. For her work, she is serving a six-year prison sentence on charges of “acting against national security,” “collusion and propagation against the Islamic Republic,” and “membership in the Defenders of Human Rights Center.” She has also been banned from foreign travel for 20 years and from practicing law for 10. In prison, Sotoudeh has been denied furlough and visits with her family, and recently her husband and 12-year-old daughter were banned from foreign travel and summoned to court without charges. 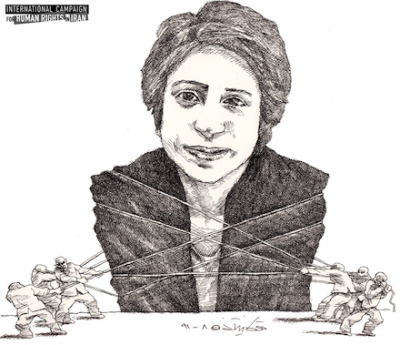 On October 17, Sotoudeh embarked on a wet hunger strike to protest the treatment of her family and the denial of her basic rights. The Campaign launched an interactive online campaign for her release in December 2011, which has garnered international support. Nasrin Sotoudeh has long been an outspoken advocate for the rights of women, children, and prisoners of conscience, often exposing the failure of Iranian authorities to uphold the law. These brave actions have made her a target. The Sakharov prize for human rights recognizes the strength of her work, and it is time that Iranian authorities release Nasrin Sotoudeh. These prisoners of the day blogs are your bread and butter, right? IRI has given you great excuses to use and sell Bi Bi's grand plan. Some believe the best and quickest way to reform this system is to weed out the criminals in the system by rewarding them for their crimes starting with criminal Judges. They must have been eating donkey brain for too long. Lies ,the sooner its very own existance comes to end. Shame on each and every single one of them who is in charge of this and shame on their propaganda Machine. از چند ساعت پیش سایتهای خبری وابسته به نهادهای اطلاعاتی و امنیتی حکومت ایران حمله هماهنگ و همه جانبه ای را علیه نسرین ستوده آغاز کرده و اتهام های واهی جدیدی را به این وکیل محبوب و در حال اعتصاب غذا نسبت داده اند. یکی از موارد اتهامی جدیدی که مطرح شده است، اتهام های واهی و بی شرمانه جنسی در زندان میباشد!! در ادامه مطلب علنا نسرین ستوده را به مطرح کردن این پاپوش ها در بیدادگاه های حکومتی که در آن خود وکیل و دادستان و قاضی و به عبارتی همه کاره هستند، تهدید کرده اند! Messianic Islamist Rapists are reform-proof and ideologically anti-human rights.